She was born in cash-strapped Russia just before the fall of the Soviet Union with spina bifida, a situation that in Tatyana McFadden’s case left her paralyzed from the waist down in a broken-down institution in Leningrad known as “Orphanage 9.” Without funds for a wheelchair, Tatyana got around walking on her hands. As fate would have it, her eyes locked with a visitor from America, Deborah McFadden, who in 1995 was visiting in her capacity as Commissioner of Disabilities for the US Health Department. Deborah and her partner decided to adopt Tatyana and brought her to Baltimore, Maryland, where Tatyana got the medical care and the family support she was not fated to receive in her home country. And thanks to the opportunities and clearly her indomitable drive, Tatyana would go on to become one of the most successful athletes in the world. Over a span of four Paralympics since 2004 in Athens, Tatyana has garnered 16 medals for TeamUSA, including 7 golds, in wheelchair racing. Not only that, she has shown incredible range, winning over the entire spectrum of track distance. At the Rio Paralympics, she took silver in the 100 meter sprint and silver in the 42.2 kilometer marathon, as well as gold medals in between in the 400 meters, 800 meters, 1500 meters and 5000 meters. Tatyana has enormous capacity not only to train and triumph, but to forgive. 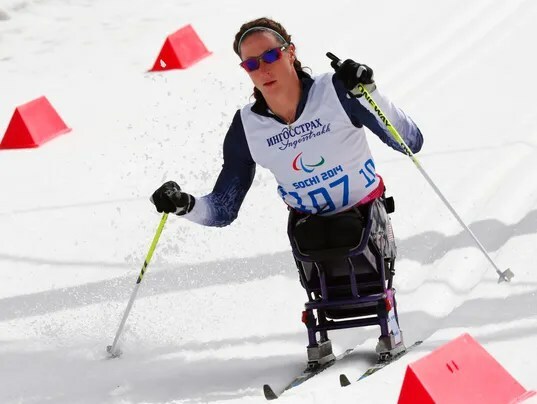 She set her sites on returning to her homeland and competing at the Winter Paralympics in Sochi in a completely different sport – Nordic skiing. Part of her motivation to learn a new sport was to see her biological mother, Nina Pilevikova. In front of her adopted and biological mothers, Tatyana incredibly took silver in 1K sprint for those who skied while sitting. Her capacity for triumph was matched by her capacity to empathize, as she related to the BBC in Sochi. Tatyana, like many Paralympians, do not aim to be inspirations. In fact, some often feel patronized by the label. Tatyana had to fend for herself in the orphanage and was brought up by parents who value perseverance in the face of difficulty and self-sufficiency. Her adopted mother, Deborah, understands that as she herself was also confined to a wheelchair for years due to a condition called Guillain-Barre Syndrome. Here’s Tatyana in her own words, highlighted in “The Mighty“, a site devoted to telling the stories of people with disabilities, diseases and mental illness. People have commented that they are “inspired” by my story. But these compliments, made with the best intentions, can sometimes miss the point. “Inspired” often means they feel sorry for my condition and what I went through in my early life, and feel they should count their own blessings for what they have. But what they are missing is that I am who I am today not in spite of my disabilities, but because of them. All of us competing in the Olympics and Paralympics have had our own unique challenges, our own strengths and talents that we have nurtured, and our own weaknesses and disabilities that we have overcome. The games in Rio are a test of our ability to push physical and mental limitations, and a testament to humanity’s indomitable spirit to adapt and excel. Posted in Other Olympics, Paralympics, Rio Olympics, Track and FIeld, Winter Sports. Bookmark the permalink.